Which Methodology Should You “Hire” to Apply Jobs to be Done? Confused about Jobs to be Done? So was I. Note: this content was originally published as a five-part series in late 2017. I’ve been asked to consolidate the content into a single post. This is the original content, updates have not been introduced with this new publication. Heard about Jobs to be Done? Maybe you picked up Clay Christensen’s 2016 book “Competing Against Luck” or you’ve seen the #jtbd hashtag on Twitter. You’re interested in this idea that “customers want to make progress in their lives and they hire products to help them get that job done” and how it can help you make progress. Unfortunately, this seemingly simple little theory has amassed a daytime-television-worthy level of intrigue and drama. Little JTBD has (at least) two men who can lay claim to have originated the approach, and others who have raised it as their own and expect some credit too. Customers don’t care about your product. They care about what it helps them do. The product in question? The ‘right’ approach to surfacing and applying JTBD insights. 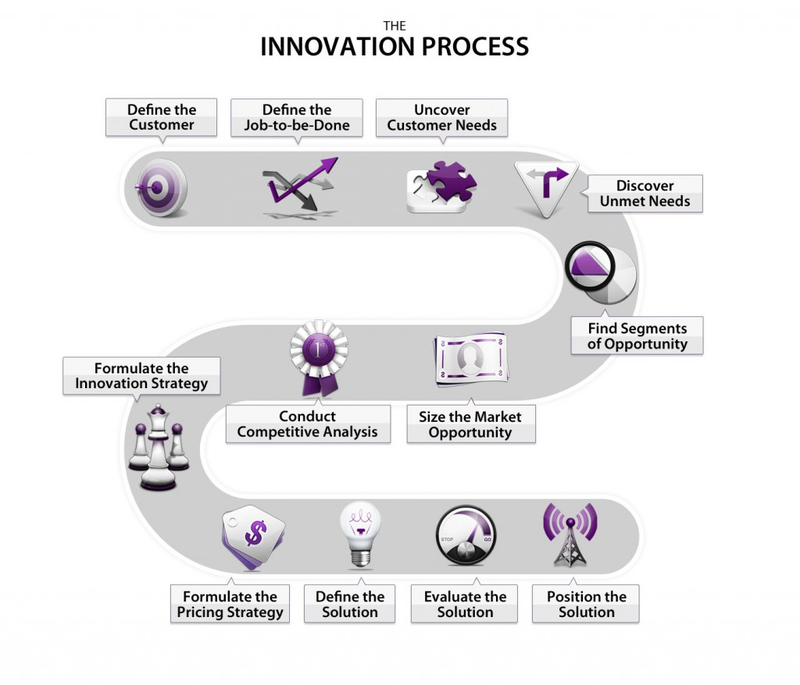 As an innovation and strategy consultant, my goal is to help my clients consistently create winning products. I’m purposely methodology-agnostic. That being said, I see a lot of value in looking at problems through the “Jobs to be Done” lens. In this article, I’ll introduce the different flavors of JTBD and how to decide which is most appropriate to help you meet your innovation goals. 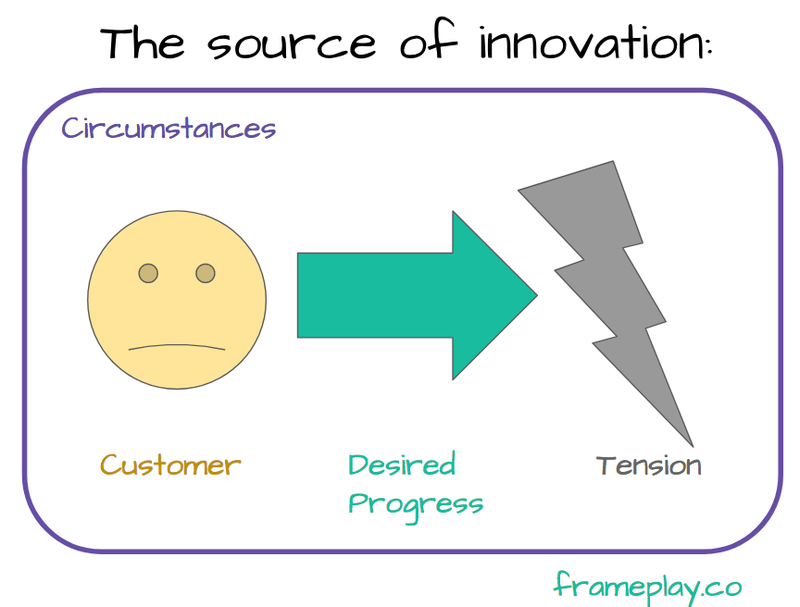 My goal is to help others pick up on the nuances of these approaches so they can make focus on making progress on their own innovation journey. There are two generally accepted schools of thought when it comes to moving JTBD from theory to practice. I first talked to Tony Ulwick about ODI in 2016. I said “oh, so you took JTBD and made it actionable!” Tony was quick to let me know that ODI predated Christensen’s book “The Innovator’s Solution”. The Strategyn approach is… comprehensive. In his 2016 book “Jobs to be Done: Theory to Practice”, Tony Ulwick lists out the 84-step process that his ODI Practitioners use in a client engagement. I’ve heard ODI described as a sledgehammer. As may be obvious, this approach is very prescriptive. It involves both qualitative and quantitative research and leads to market and product strategy formulation. Sound great? All you consultants out there, don’t get too excited. ODI is a proprietary approach developed and practiced by Strategyn. If you’ve ever seen an offer to ‘learn how to run a JTBD interview’, you’re probably learning a technique developed by the Detroit-based Rewired Group. They hold in-person workshops and there’s also an online video training series to help people learn how to conduct Switch interviews. why consumer satisfaction is important, but it fails us when we’re developing new products. The Switch interview training focuses on the gathering of insights, but does not include any discussion of how to interpret and apply the findings. As a result, it has become a fruitful starting point for a variety of different ways to interpret and apply findings. Clayton Christensen, Harvard Business School professor and author published “The Innovator’s Dilemma (1998),” “The Innovator’s Solution (2003)” and “Competing Against Luck (2016)”. These books introduced the concepts of disruptive innovation and Jobs Theory. Tony Ulwick is the founder of Strategyn and the author of “What Customers Want (2005)” and “Jobs to be Done: Theory to Practice (2016)”. He explains how he introduced the Strategyn Outcome-Driven Innovation process to Christensen in the late ’90s as a way to solve the Innovator’s Dilemma in this blog post, which also features a fantastic video from 2000. Oh, that fashion style! In “the Innovator’s Solution,”, Christensen mentions Rick Pedi, the CEO at Gage Foods who coined the language ‘job to be done’. In his most recent book “Competing Against Luck”, Christensen retells the story of Rick Pedi and his partner Bob Moesta as consultants who were working in the baking industry and wished to learn more about disruptive innovation. Bob Moesta and Chris Spiek founded the Rewired Group and you’ve probably heard them on JTBD Radio or the aforementioned Switch Interviews video. Jay Haynes runs thrv, which is a Jobs to be Done Product Management Software platform, and also offers services & training. He’s also the former CEO of Strategyn, so the interface includes the Desired Outcome Statements that are uncovered during the ODI process. (Updated Dec 2017) Alan Klement is the author of what he claims is the first book dedicated to Jobs to be Done (in 2016). As will be obvious over this series, this is simply not the truth. And look at what I’m doing, even now. I’m focusing too much on the ‘products’ and not enough on what they can help you do. Selling Jobs to be Done: Who’s the Customer? The Jobs to be Done theory — that “customers want to make progress in their lives and they hire products to help them get that job done” — can revolutionize a company. Rather than focusing on how to compete in a feature war against other competitors based on ‘industry standards’, you have the ability to break away as a result of unique customer insights. But great potential can lead to great confusion. Customer insights can ripple across an organization, and be interpreted differently by different parties. That’s why understanding the context and circumstance that leads to JTBD research is so important. Over the past few weeks, I’ve talked about JTBD with three prospects. Each came to me already thinking JTBD could solve a problem in their business. But each had a different problem to be solved; a different Job to be Done. Each wanted to learn about their customers’ Jobs, but held a different vision of the progress they were trying to make. Not only did each of these customers have a different view of the progress they were trying to make, each one had a different target object he planned to act on. Sales and marketing will change. The product will change. The entire organization will change. Our product portfolio will change. Remember, Jobs to be Done is just a theory about how any why customers and ‘hire’ products into their lives. Even as you learn about and accept the theory, how it’s applied to your organization to meet your specific goals will be unique to you. If you’re part of a team eager to bring Jobs to be Done into your organization, great! You can (hopefully) see how understanding your customers’ progress and struggles can transform your business, and what target objects you have to work with. Now we have much more information about the customer, his desired progress, and the target object he plans to act on. Soon we can start digging into his struggles and identify a way to move him forward. But first, we need to Define the ‘Job’ in Jobs to be Done [Pt 3]. If you want to apply your understanding of your customers Jobs to be Done to create impactful products and services, you need to know what Jobs are in question. Seems simple, but right off the bat there are some differences in terminology. Process need, unlike the other sources of innovation, does not start out with an event in the environment, whether internal or external. It starts out with the job to be done. It is task-focused rather than situation-focused. It perfects a process that already exists, replaces a link that is weak, redesigns an existing old process around newly available knowledge. Customers — people and companies — have “jobs” that arise regularly and need to get done. Their thought processes originate with an awareness of needing to get something done, and then they set out to hire something or someone to do the job as effectively, conveniently and inexpensively as possible. The functional, emotional and social dimensions of the jobs that customers need to get done constitute the circumstances that they buy. The jobs that customers are trying to get done or the outcomes that they are trying to achieve constitute a circumstance-based categorization of markets. Companies that target their products at the circumstances in which customers find themselves, rather than at the customers themselves, are those that can launch predictably successful products. 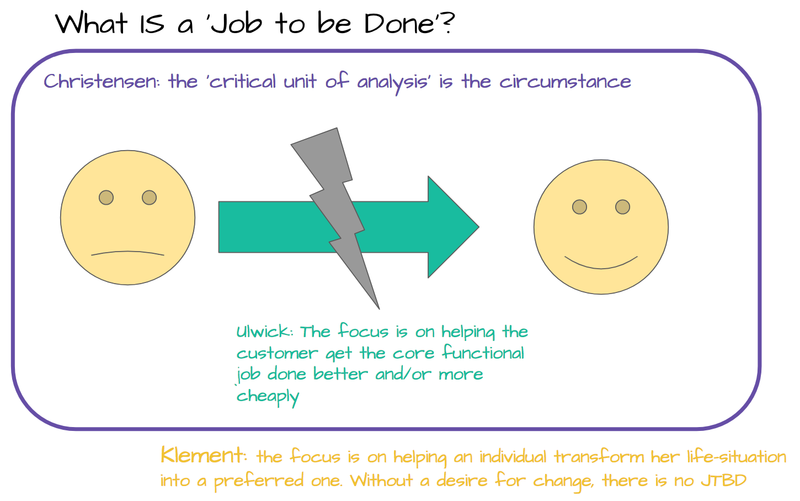 Put another way, the critical unit of analysis is the circumstance, and not the customer. There are three different types of jobs that customers are often trying to get done in a given circumstance: functional jobs and personal and social jobs (two types of emotional jobs). Functional jobs define the tasks people seek to accomplish, personal jobs explain the way people want to feel in a given circumstance, and social jobs clarify how people want to be perceived by others. Products don’t engender emotions. Situations do. To provide the complete set of functional, emotional and social experiences in purchase and use that will sum up to nailing the job perfectly, the situation — rather than the customer — must be the fundamental unit of marketing analysis. People buy products and services to get a job done. The job the end user is trying to get done is the core functional job. The core functional job is the anchor around which all other needs are defined. It is defined first, then the emotional, related and consumption chain jobs are defined relative to the core functional job. Leave emotional and other needs out of it. When defining the core functional job make sure it is defined as a functional job, not as a hybrid functional/emotional/social job. 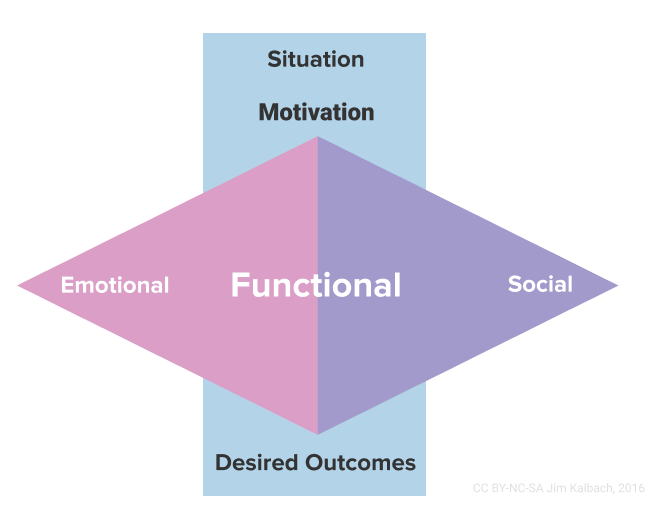 A functional job does not have social and emotional dimensions. The emotional and social jobs related to the core functional job are defined in a series of separate emotional job statements. The concept of Jobs to be Done provides a lens through which to understand value creation. The framework looks at customer motivations in business settings. Jobs to be done are ultimately about an underlying need and desired outcomes. Viewing value creation in this way shifts focus from the psycho-demographic aspects of individuals to their goals and motivations. It’s not about the user but about usage. The context of the job is critical to understand. Jobs to be done is an existing framework that helps view value from an individual’s standpoint. The practice looks at why people “hire” products and services to reach a desired outcome. Typically, a JTBD is expressed in terms of its functional job. Because of this some people have the misconception that JTBD is the same as task analysis. Jobs theory sees people as goal-driven actors. The job is really about progress toward a goal. The JTBD approach shows causality — why they behave the way they do. Jobs to be Done can be used to 1. Understand the Market, 2. Design for the Market, 3. Talk to the Market, 4. (Re)define Markets. A Job is one’s emotional struggle to make life better. It’s Done when one finds the right solution to overcome that struggle and make that better life happen. A JTBD is purely emotional. Tasks, activities, or functionality describes solutions for Jobs. Updated Dec 2017: Klement’s definition of a #JTBD is now tied to purchase behavior. He has recently stated that he is solely interested in researching customer demand, and it’s up to others to drive strategy and make decisions. If I’m buying and using the same types of products I’ve always used, I’m executing habits. If I’m executing a habit, I’m not interested in progress. I have no JTBD. “Get from A to B” is not a JTBD. A JTBD explains why I changed my historical use of the market. I used to own a car but then I switched to Uber. Why? I desired change. … This is a stark departure from any previous interpretation of Jobs to be Done. In the opinion of this author, this is not an ‘evolution of Jobs Theory’. This does not help aspiring innovators create better products/services. It’s included here for completeness, but not recommended. If you’re looking to hand over your JTBD research to your product and engineering teams to execute on, you’re going to get some pushback if you walk in with a description of a customers’ emotional struggle. If you show up with some direction of how the product should be improved to help the user, they can dive right in. There’s a lot of literature on Jobs to be Done. Keep in mind the progress you and your team are trying to make before you hire one approach or another. And now, onto the struggle! The Struggle and the Opportunity! Jobs to be Done is about a customer making progress towards a desired future. In order to innovate, we want to understand not only the progress the customer is trying to make towards a desired future, but also the challenges he’s facing in his journey. Here too the Jobs to be Done community have a few different ways they interpret these concepts. Those metrics are described in Outcome Statements with a rigid sentence structure. It is common for between 50–150 Outcome Statements to be uncovered for a given Job to be Done. An example of an Desired Outcome Statement would be “minimize the time it takes to place a saw back in service when the power cord is cut”. In the 2007 paper “Finding the Right Job for your Product (2007)”, Christensen introduces the idea of creating “Situation Cases” as artifacts after something that strongly resembles a Switch interview. Create a list of “Help wanted” signs: deficiencies and constraints in current solutions that need to be alleviated to grow the market. The article didn’t actually mention what the fifth paragraph entailed. Don’t shoot the messenger! Through the interview, researchers are documenting the forces at play from the point a customer was triggered to make a change, through to his decision and first experience with the new solution. According to Bob Moestra, “Any struggling moment is the seed for innovation.” Check the interview or transcript to hear him speak more about the ‘following the energy’ and identifying user dimensions. 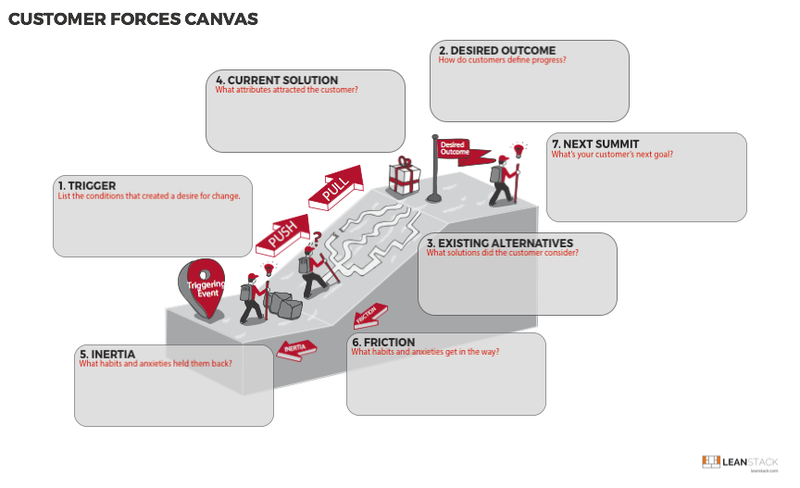 Author and LeanStack Founder Ash Maurya has also introduced a related “Customer Forces Canvas” to assist innovators in capturing their learnings from customer interviews. One thing that’s worth noting in the description of the Four Forces diagram: “when a consumer seeks to make progress (by purchasing a product or service).” This approach and tool is applied in response to an action by our customer. He’s recently switched products. We use this to signal dissatisfaction, and use this as an anchor around which the insights gathering is conducted. This can be very effective when that’s the behavior we’re trying to model in other customers, but it also severely limits the scope of our research and application of learnings. Jobs to be Done practitioners all agree that demographic-based personas are a poor way to segment a market. Instead, the customers’ Job to be Done should be considered. In each case, it’s not enough to simply segment customers by their Jobs to be Done and go after each of them with equal vigor. Additional dimensions should also be considered. In the case of ODI these are the Desired Outcome Statements, in non-ODI projects other user Dimensions are likely to have surfaced through the course of the interview. Christensen recommends focusing on non-consumers; stating that “competing against non-consumption often offers the biggest source of growth in a world of one-size-fits-all products that do no jobs satisfactorily”. He advises focusing efforts on those potential consumers who are trying to get a job done but are unable to accomplish it because current solutions are too expensive or too complicated. It’s important to note that these aren’t people who don’t have this job, but rather those who are getting it done in an inconvenient, unsatisfying or expensive way. The ODI process appears to address this by generating an “Opportunity Score” — the degree to which a specific outcome or related or emotional job is under- or over-served. The Switch interview technique runs the risk of missing key insights about non-consumers since it explicitly focuses on engaging with those who have hired a solution. While there’s no (publicly available) follow-on activity to turn insights from Switch interviews into strategic direction, the “Help Wanted” section described in the Situation Case Summary listed above may provide a foundation of qualitative information to start from. In this post, you’ve learned how about understanding Jobs to be Done can change how you design, market and sell products to your customers. Developing an understanding of customers’ Jobs to be Done can also serve to drive a product portfolio strategy. This may involve either developing complementary products that help a customer get their entire Job Done better, or competing products that appeal to over- or under-served cutomers. This post was intentionally non-prescriptive. Your own circumstances and capabilities will lead you to the solution that’s best for you. As always, I welcome questions, comments and corrections to ensure this information is helpful.